and saw she had joined a font linky party, I knew I was in heaven. All in different fonts in one place. What could be better? I am joining Teachery Tidbits’s Favorite Fonts Linky Party. Click on the picture to find some great fonts. Every New Beginning introduced me to a new site that is perfect for font lovers. It is called Word Mark It. Have you heard of it? This site will show you a word or words written with all of the fonts on your computer. 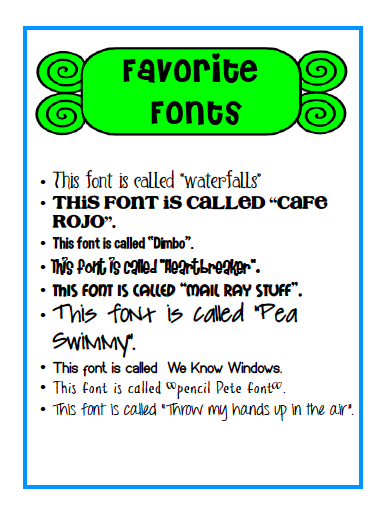 So, the next time you are writing a new lesson and want to choose a font, visit Word Mark It. This is a great time saver! Here are a few of my favorite fonts. Google the name if you’d like to add them to your collection. I found this linky party, too, and almost exploded my computer downloading fonts! Cafe Rojo is one of my favorites also. Dare I say that I like fonts more than I like clipart?? I also did the Font linky…I don't know how I could pick my favorites from 30 or so I use all the time! 🙂 Hadn't heard of Word Mark it…heading over to check it out! Thanks for the link to Word Mark It. Haven't ever heard of it but I checked it out and it's really neat! Thanks for the tip about Word Mark It. That is awesome!